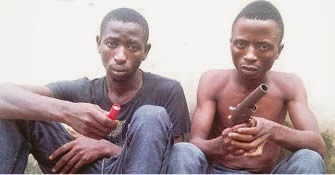 Sikiru Oyebamiji and Afeez Salami, who were arrested by the Lagos State Police Command, for armed robbery, confessed that robbing people was more profitable than their legal job. They were Mushin area of Lagos and were found with a locally-made pistol. They were nabbed by the Special Anti-Robbery Squad on Friday, July 31, around 12.30am when they were allegedly heading for an operation. It was further gathered that the duo had taken a cab from Oshodi, and the vehicle had got to a checkpoint around Mushin where SARS operatives asked the occupants to alight. The suspects were said to have ordered the driver to evade the policemen, threatening to shoot him if he refused. But the operatives arrested the suspects and recovered the pistol from them. After their arrest, the suspects confessed that they were nine in the gang. They also told the police that there were two other locally-made guns belonging to the gang. The suspects said that they had taken to robbery because their respective jobs were not lucrative enough. Twenty-four-year-old Oyebamiji who hails from Apomu Ikire, Osun State, said he was a cobbler and bus conductor before he joined the gang. Oyebamiji, who lives on Lawanson Road, Itire, added that he had gone for about five operations with the gang, and made at least N20,000 from each. The second suspect, 21-year-old Salami also said he took to robbery because his work was not lucrative.